Dolce Austin is a place where people can find their inner and outer beauty, and they are inspired to make a difference in the world and in the community by using their talents as make-up artists and hairstylists. But apparently, their talents don’t stop at hair and make-up, as these creative ladies combined forces to design an art bra for the fun-loving and young at heart. 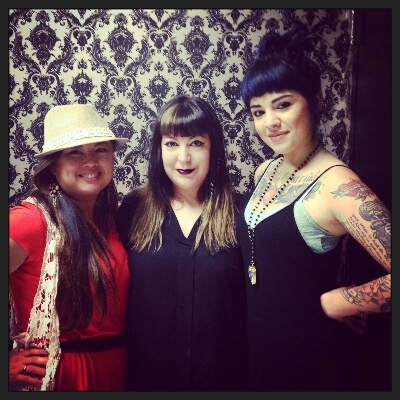 The Dolce Austin design team is comprised of Cris Coleman, the owner of Dolce Austin, and make-up artists/hairstylists MJ Escribano and Brittany Craig. While Cris provided the materials for the bra, MJ and Brittany got busy designing and creating. 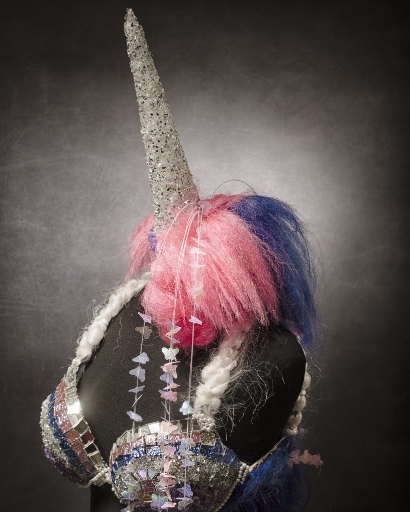 “Nothing is more magical than a unicorn,” they state, “and that’s how we wanted our model to feel when she wears our bra.” They used hair, glass, foam, stones,head bands, pearls to create the bra and accompanying head piece with a horn, and worked on it at Dolce Austin in between client appointments. Dolce Austin is proud to be a part of this wonderful event that brings inspiration and hope through art and fashion, and wants to remind the Austin community that they offer free head shavings in private rooms for anyone going through chemotherapy. To book an appointment, visit www.dolceaustin.com or call (512) 474-1174.